THIS IS WHERE & WHEN THE MAGIC HAPPENS. As mentioned throughout our site, we're big fans of transparency. As in: What you see is what you get, and anything we get from our generous sponsors and/or donors you’ll be able to clearly see put to work for the benefit of local trails, local communities, and beyond. This is the page wherein you'll be able to find information about our upcoming projects and events. We hope you're as excited to hear about them as we are to share them! If you're looking for one of our FUNdraising trail races, you can find those right here. Want to do some trail work? Sign up here. ​If you see something you like enough that you'd like to help us make it happen, please go here to read about the variety of options for traveling along with us: In person, in spirit, and in checkbook. WHAT: A Night Out For Trails! 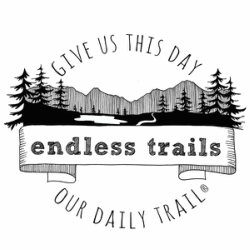 ​WHY: To raise money for Endless Trails, and thus local trails all over the Northwest, to celebrate being outside, and to enjoy fellowship with this outdoor community of trail lovers! We'll also have an online silent auction in the weeks ahead of the event, with all proceeds going back to local trails. HELP NEEDED: By way of silent auction donors and participants! If you yourself want to volunteer, and/or donate anything for the silent auction, or know of someone in the NW who does, we'd love to talk to you. Read more here! ​HERE'S AN ADDITIONAL WAY TO GET INVOLVED: GIVE! There are so many ways to give (via volunteer hours, goods/services, expertise, donations, hugs and high-fives, etc. ), but below are a few concrete options to get you started. Please know each and every dollar and/or item and/or helping hand donated will be gratefully and graciously received, and put to very good and long-lasting use. A recurring monthly donation. These can be made in any dollar increments, and can be discontinued at any time. No contracts. No obligations. A donation to support a specific trail work party. Click here to see scheduled trail work days. A donation to support an upcoming Endless Trails race. Click here to see all of our fundraising trail races. A donation to support a specific upcoming Endless Trails project and/or event. That's right! Just choose the project/event/trail work party/race that speaks to you most from the list and links above, write the name of that project/event in the notes when you donate (and/or on the "Memo" line of your check(s)), and we'll make sure your donation is fully applied where you want it to be. You'll also receive personal updates from us about the status of the project. We'll be announcing more exciting trail work dates and projects as they're created! ALL OF THAT TO SAY: THANK YOU. We've a great undertaking ahead of us, and we're beyond stoked that you're here. We couldn't be more excited to see what we as a local and global community of inspired humans can do for one another, and for our beloved outdoor spaces. LET'S MAKE SOME MAGIC HAPPEN, YEAH? If you/your company/your family and/or friends/your running club/your favorite coffee shop, or anyone else you know are interested in getting involved with any of the projects above, or in any other way, please send us a message using the contact form below!